Aeology | Interior Boutiques – Antiques for sale and mid century modern furniture, french furniture, antique lighting, retro furniture and danish furniture. 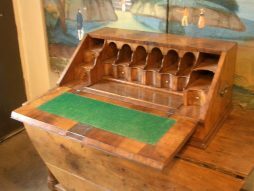 The Desk was originally made for a country lawyer or doctor to take with them on coach journeys.. With brass lock and key, brass carrying handles ,old slightly worn green baize on the inside of the lid, the desk was basically intended for travelling but also has a specially made carved walnut pedestal. on which it can sit while in the home or office. The matching veneered loops in the walnut showing on the front of the lid are exceptionally beautiful and typical of best furniture making craft in England during that period. Measures 36 inches wide x 16″ high x18″ deep. 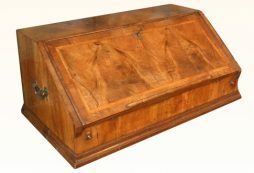 A unique and handsome piece from one of the most sought-after periods in English furniture -making. In excellent condition. The desk is presently in my London home, and sits on a table top near my computer. 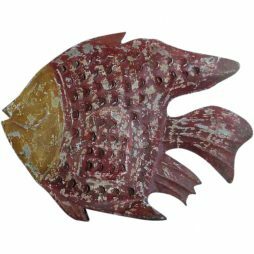 A decorative Peters Fish made by a local artisan metalworker for a restaurant in the fishing port of Sete in southern France. The fish has an internal compartment with a hinged door inside which there is a small candleholder. St.Pierre or Peter’s Fish, also known in England and America as John Dory is one of the staple ingredients of Bouillabaisse the famous fish stew of the French mediterranean coast. Dating from between 1925-1950, the metal sculpture measures 25 inches long x 19 high. 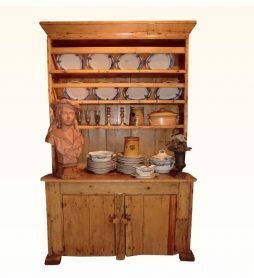 A very pretty and quite primitive small Irish Dresser in old pine, circa 1840-1860. Coming from county Meath, with original wide backboards and plain wood cupboard front doors, this an ideal little dresser for either a country cottage or a town apartment. 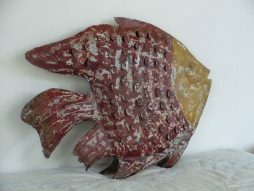 In original condition with acceptable wear and tear and some ancient repairs, measures 5ft 11 inches high x 4ft wide. In one single piece. Handsome Wall Mirror from France. 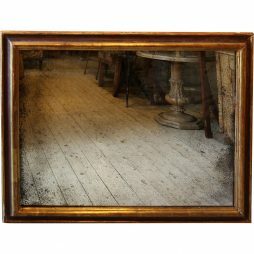 The original 19th century painted and gilded frame has a restored mirror glass which has been re-silvered in a now fashionably ‘foxed’ or ‘antiqued’ style. 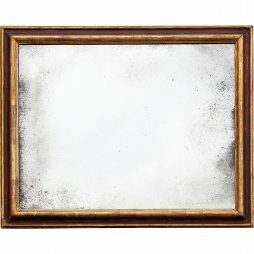 An option is to replace the ‘antiqued’ mirror with a new mirror glass. Please enquire on the site. 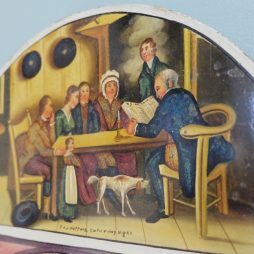 Shown hung in ‘landscape ‘ position, it can also be hung and used as ‘portrait’ looking glass. Measures 46 inches x 34. From France, the frame is circa 1890-1910. 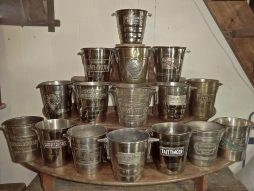 Dating from the 1920’s to the 1950’s, the Buckets are marked on the bases with maker’s name ‘ ARGIT PARIS’., and are offered here, either as a collection or singly on application – some being rarer than others. 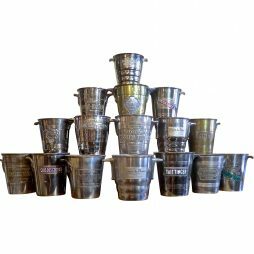 The buckets measure approximately 8 inches tall each. FOR INDIVIDUAL PRICES PLEASE CONTACT THE SHOP. 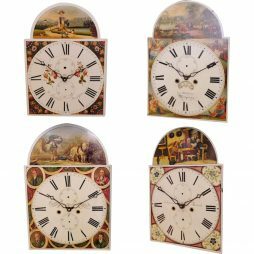 Four very handsome and traditional hand-painted iron 'Grandfather' Clock Dials from early 19th century Britain, each now fitted with a modern battery quartz movement. For sale either as a group or separately , each clock face can be individually hung so that it functions as a battery driven working clock. 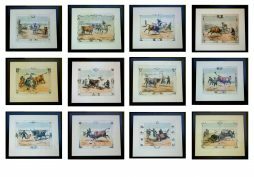 The top paintings show variously a rustic farmyard with people and animals, a boy with his dog, a kitchen scene and an aristocrat with a horse plough and background castle. 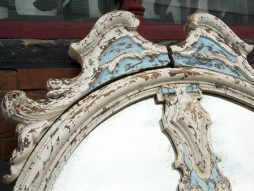 The clock faces have each had a small amount of restoration by an artist. 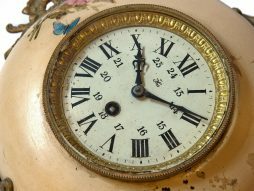 Each clock face measures 18 inches high x 13 wide and is dated circa 1790-1850. 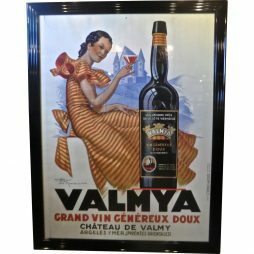 Superbly Framed Famous French Wine Poster designed by Henri Lemonnier and published in 1937 in Paris. 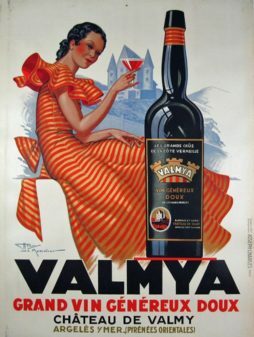 Printed by lithograph, the poster, which has been linen backed , depicts a woman dressed in Spanish costume holding a glass of ‘Valmya’ tonic wine which was produced at the Chateau de Valmy at the town of Argeles-sur-Mer on the ‘Cote Vermeille’ (The Green coast) close to the frontier with Spain. Lemonnier was one of the most celebrated designers of poster art in the inter-war years and this was one of his most decorative advertising creations. 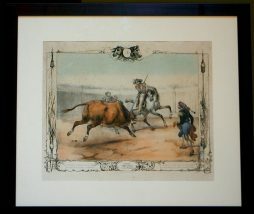 The poster has been framed behind glass in 3 inch wide ‘Art-Deco’ framing. The linen backing guarantees that the printed paper will not crease or crumple with time so long as the poster is hung in a temperate location. Measures 69 inches tall x 53 wide. Lemonnier’s signature is printed on the poster beneath the ribbon on back of the woman’s dress. 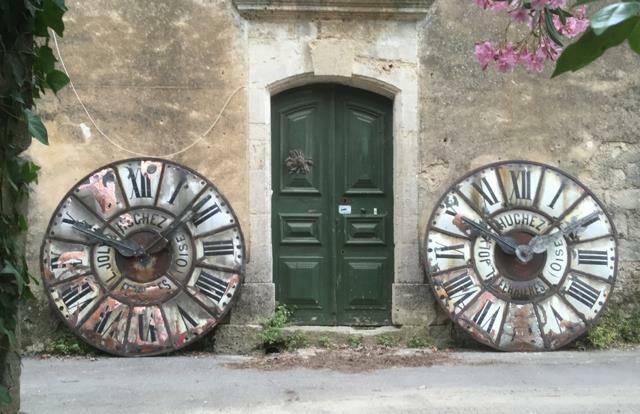 19th century metal Wall Clock from France. 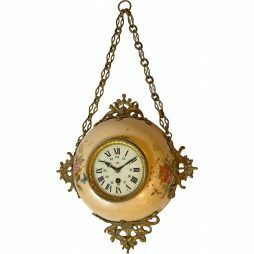 Made to hang by a decorative chain and with a high quality brass 'drum' movement made by celebrated 'Japy Freres' company , this model of wallclock was known as 'Boulangere' (Baker's)clock because of its bun shape. The clock has pretty hand-painted flowers on the metal case , 4 decorative bronze brackets at the compass points, and was made to hang by the brass chain. The clock comes with an original wind-up key. Measures 14 inches diameter including the brackets – 23 inches hanging height. In good condition From France circa 1880-1900. 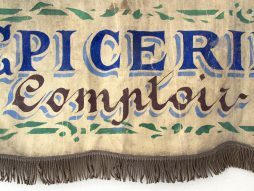 Old Decorative Lettered Canvas Shop Awnings from France. 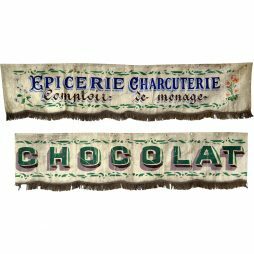 The canvas drapes with tasselled fringes and lettering specially printed with dye have been used for years hanging from a shopfront blind and now having a wonderful patina, can be hung on a wall as vintage signs or used as drapes or window pelmets. 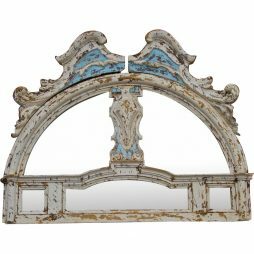 Very Decorative Large 19th Century Mirrored Entryway Pediment which came from the front entranceway of a house in Florence., Italy. The heavily carved wooden pediment is in the remains of old paint , but the original glass panes have now been replaced with mirrored ones. The result is a historic and decorative piece to display in a restaurant, club or private home. Measures 45 inches wide x 36 high. 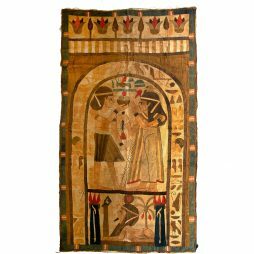 Impressive Patchwork Wallhanging depicting Ancient Egyptian Husband & Wife at their Wedding Ceremony above a lower panel depicting a Sphinx . with a little bit of natural wear, this is a beautiful and colorful souvenir of a ‘grand tour’ to Egypt in the period just before the First World War. The patchwork measures 68 inches high x 36 wide. 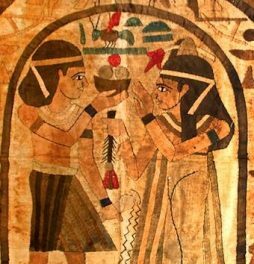 In reasonable condition with some discoloration from age, hand stitched on a hemp backing by needlework craftswomen in Egypt, circa 1890-1910. Its often assumed nowadays that the Egyptian patchworks date from the Art Deco ‘Egyptian Revival ‘ period of the 1920s. But I believe that they were also being created and sold before that time to the late Victorian and Edwardian tourists- and in which case can now be classed as ‘antique’. But maybe subject for further research.